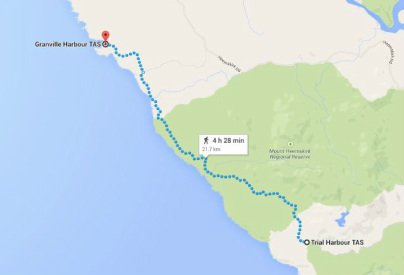 Trial Harbour to Granville Harbour - allow 2 hours one way. If you do an out and back, we suggest you ride from Granville Harbour to get the worse direction out of the way first. This will make it a 36 km round trip and take between 3 - 4 hours. This ride is open to the extreme weather and WIND of the west coast, as you are right on the coast. It will either be a really great day or S^*T! Last supplies are at Zeehan including public toilets. You can ride out from Zeehan, which will take you just overna hour. Zeehan has a nice little tunnel to explore as well and is part of the Wildside race.